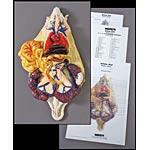 Highly detailed and expertly prepared, this durable life-size model was patterned on an actual dissected rat. Made from unbreakable material and hand painted for accuracy, it features a number of detailed structures including a foetus in a partially dissected uterus and a sectioned kidney. Includes a key identifying over 50 structures. Size: 111/2"L x 61/2"W x 23/4"H.